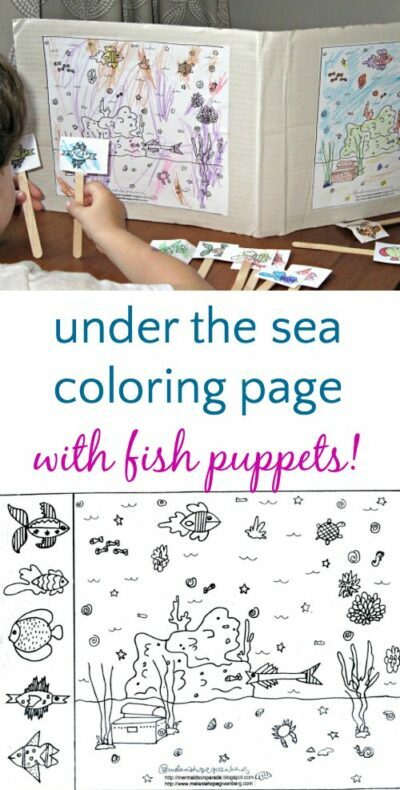 This month’s free printable coloring page is an ocean coloring page, with little fish you can turn into puppets! Melanie Hope Greenberg’s sea life scene includes ocean animals like cute little crabs and turtles, and even a treasure chest. The best part? 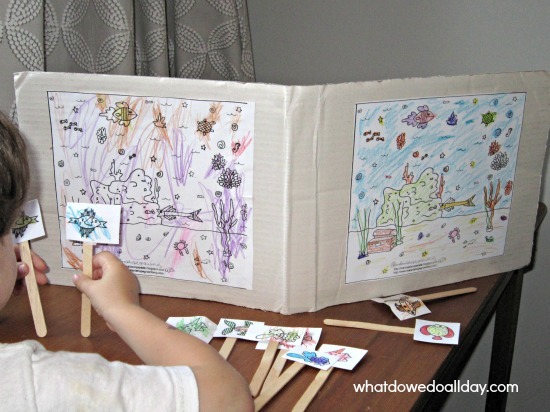 The ocean scene coloring page doubles as a storytelling activity and prompt. Cut out the deep sea part of the printable (use two if you like, as shown in photo) and glue to a piece of cardboard that you have folded so it stands upright. Cut out the fish. You can cut them out carefully along the lines, but I prefer to let kids cut them out in rectangles. It’s easier and the kids will feel more ownership if they cut them out themselves. Tape or glue each fish to a craft stick. My 4 year old had a grand time making up all sorts of stories with his new fishy friends and the ocean coloring page. If you missed last month’s mermaid paper dolls coloring page based on Melanie Hope Greenberg’s book Mermaids on Parade, you absolutely should head over and print it out. I’m pretty sure King Neptune and Queen Mermaid would feel right at home in this colorful under-the-sea resort. Melanie Hope Greenberg is an award winning author and illustrator of more than 15 children’s books, including the very popular Mermaids on Parade. A wonderful book to read aloud while your kids color their ocean is Down in the Subway, written by Miriam Cohen and illustrated by Melanie. The story follows Oscar as he begins a train ride with his mom and baby brother. But instead of the usual commute, he and his fellow passengers are awed as an Island Lady and Calypso Man fill the air with their music and poetry. As they sing and play ocean breezes and seaside life magically take over the car. Visit Melanie’s official website to learn more about her work and other books. It’s very clear who colored what 🙂 Lovely scene! What a cute printable! I think my kids will enjoy this – thanks! This is such a fantastic play prompt and art project rolled into one. And the printable is fantastic! Thanks so much for sharing. Thanks, Joyce. Melanie will be happy to hear that! I am so happy to read these comments! YAY! Thanks everyone!